Dense and heavy flowers Natural Power Growth Bloom Excellarator by Advanced Hydroponics.. 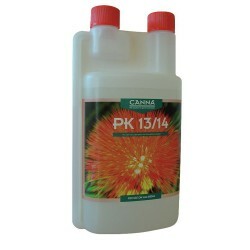 If you want the biggest fruits and flowers, CANNA PK 13/14 is the right product for you. CANNA PK 13..
CANNABOOST Accelerator is CANNA's flagship flowering stimulator, specially d..
VitaLink Buddy is a PK additive rich in potassium and phosphorus with added Magnesium and Sulphur to..
A straight PK additive, VitaLink PK is rich in potassium and phosphorus and encourages a better, ful..